With the assistance of the Take Me Riding website, it has never been easier to introduce kids to the wonderful world of horses. 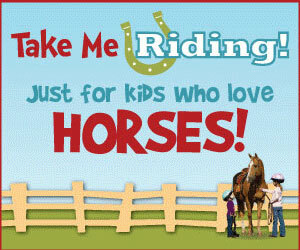 Take me riding introduces kids to the wonderful world of horses. Now it is simpler than ever to get your kids involved with horses with the Take Me Riding website. Take Me Riding is a revolutionary effort to introduce children to the world of horses. It is an all-breeds “edutainment experience” for children ages 5 to 9 and can be found online at www.TakeMeRiding.com. Take Me Riding is designed for the fast-paced family lifestyle, and efficiently works on mobile devices and tablets. Desktop or laptop users have an enhanced experience with more games and a customizable Riding Space where children can collect images of horses, earn badges for their online and offline horse experiences, track their progress and much more. In addition to all of the interactive features that kids can explore, there will also be new educational videos posted every week. The primary focus of Take Me Riding is three original video seasons, each with nine episodes that follow the lives of Jack, Anna and Grace. Take Me Riding is also packed with resources for Mom and Dad, lesson plans built around the common core standards for teachers, an event calendar that offers upcoming horse events near children and a store that carries almost anything a child could ever want, except a real horse. Once a child has shown a strong interest in horses it can be difficult for parents to know where exactly to look to take the next step in furthering their child’s interest in horses. With the comprehensive geolocation map Take Me Riding makes it easy to find trusted trainers, instructors and locations to inquire more about a real horse experience. Why waste time looking for the right barn or instructor when Take Me Riding has done all that hard work for you already? The geolocation map offers a trusted, stress-free way to find reliable people in the horse industry to help guide parents and their children on their horse riding journey. Simply type in a zip code and then explore all of the options for trainers, events, riding centers and famous horse landmarks that are available in the area. Getting a child horseback has never been easier! Much more is planned, and these projects need your support and help. A generous gift from Wagonhound Land and Livestock and financial support from AQHA have funded the start-up costs of this project, however these efforts are nowhere near complete and future enhancements to keep up with the fast pace of technology are already being mapped out. For information about the fundraising effort, please visit www.aqha.com/foundation or call 806-378-5029.